Everyone wants to go to Scotland and play the famous courses. If they don’t, they should. It’s the home of the game, it’s where golf architecture was born from a marriage between the land as it was found, and the game to be played. 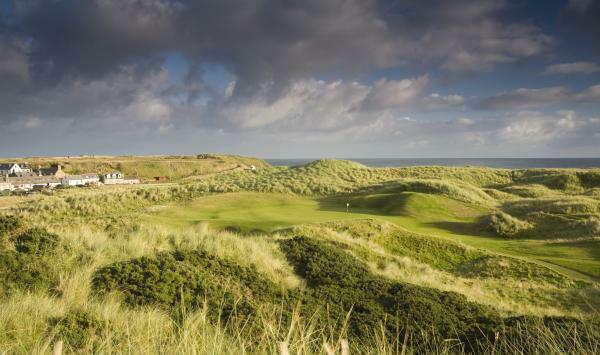 These five courses are not on the Open Championship rotation, but they are very bit as challenging and would comprise a wonderful itinerary if you decided to make a pilgrimage. 1. Cruden Bay. A major course on the east coast. The opening drive on a 416-yard par 4 pitches down along the coast. From there, the rest of the course winds among shaggy sandhills which make a course that should not be missed. 2. Nairn. The site of British Amateur and Walker Cup competitions, Nairn is duneland golf — fast but narrow fairways with the sea always in view. 3. 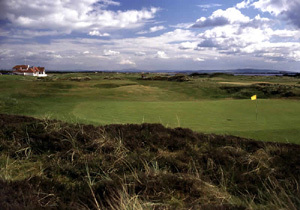 Western Gailes. 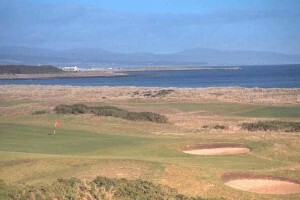 This course serves annually for Open Championship qualifying. Holes 1 through 11 are the essence of links golf. Hummocks, bunkers, and greens exactly where they are supposed to be, tucked between the railroad line and the sea. 4. Brora. 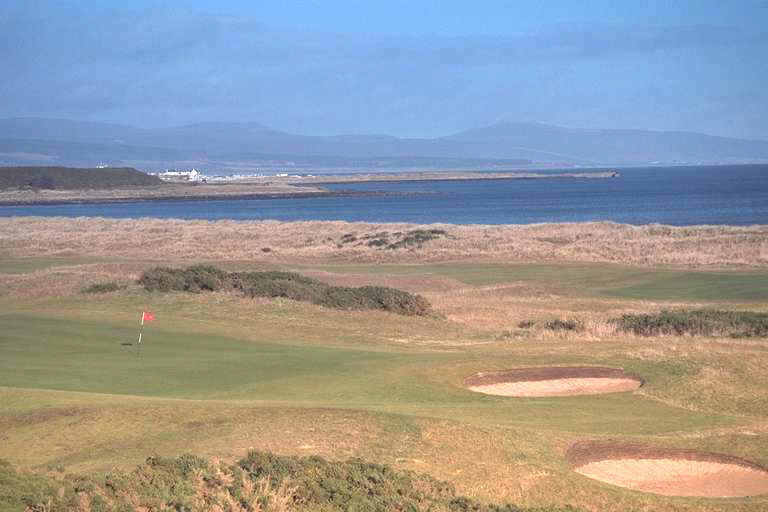 This is the northern-most course of quality in the British Isles, designed by James Braid. Notice the fence surrounding the green. Sheep graze freely on the course, and the fence is to keep them off the green. 5. 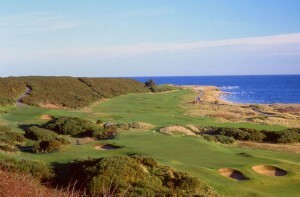 Royal Dornoch. Donald Ross grew up on this course and every architect visits it and studies it. This is the course Tom Watson said he would choose if he only had one course to play on. To read more about these courses, I strongly suggest the book, A Golfer’s Education, by Darren Kilfara. This Harvard student provides masterful descriptions of these courses and his experiences on them which he played during his year abroad at the University of St. Andrews. 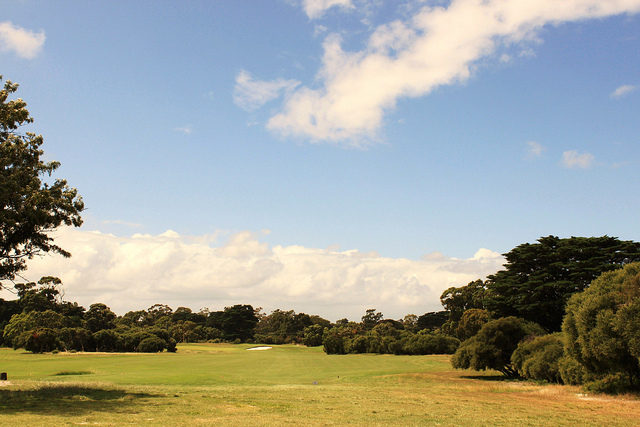 This year’s President’s Cup will be played on one of the great golf courses of the world, the Royal Melbourne Golf Club in Victoria, Australia. In former years, the same holes were used, but the routing, shown in parentheses, was different. For example, what is the first hole this week used to be the 13th hole. Holes of note (current routing) are the fourth, sixth, and seventeenth. The fourth hole, a 401-yard par 4, requires a blind, uphill drive directly over an imposing array of bunkers on the right. The safe shot into the fairway runs the wrong direction for a shot to the green, and most second shots will be hit from a downhill lie. The green, like all at Royal Melbourne, features subtle slopes that cannot be seen until it is too late. Four is a good score here, and five will be easy to make. 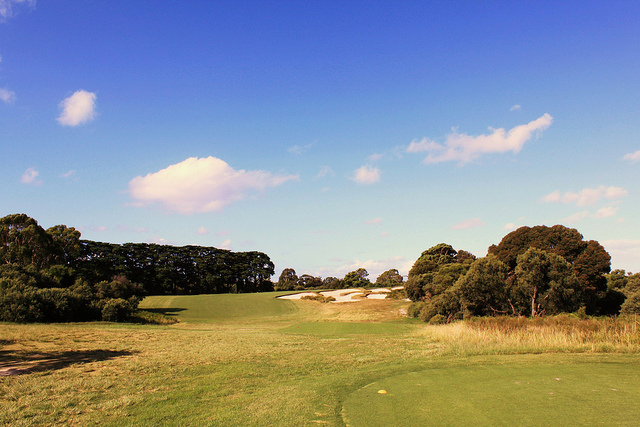 The sixth hole is a very short par 4 – only 285 yards. The catch is that the drive must be hit over an enormous bunker that is built into the side of a hill. A shot out of it will be hit from a level well below the green. 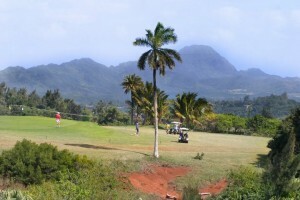 The safer angle crosses a valley to a crest at the same level as the tee. Miss the crest and you have a blind pitch into the green. The seventeenth is a famous hole for its deception from the tee. The fairway is so wide that it’s almost impossible to miss, yet unless the ball is put in the right spot, finding a way to get the second shot near the pin will not be easy. 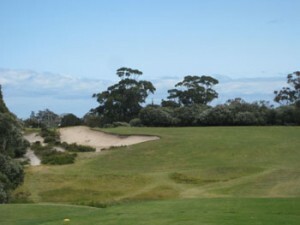 Even though the course is in the middle of an urban area, it has the look of being in the Australian wild. Royal Melbourne is one of the most beautiful courses in the world, I think, for that very reason. I’ll be watching the broadcast as much to look at the course as to see the competition. I got back from my vacation to the Southwest yesterday. My wife and I hiked across the Grand Canyon, from the north rim to the south rim, in two and a half days. We had a wonderful time. 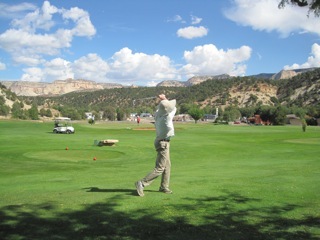 What made it even better was playing golf in the midst of the desert, not at a resort course, but at an executive course in the heart of the Colorado Plateau. It’s called the Thunderbird Golf Course, and it sits at the intersection of highways 9 and 89, between Kanab, Utah, and Zion National Park, in a place called Mt. Carmel Junction, Utah. The course is 1,868 yards long from the whites, par 31. The course record is 24, I asked. This is not a destination, believe me. You would have to be there for another reason. I seem to be going there every few years. I had passed by the place three times in the last ten years, and each time I really regretted having to keep going. On this trip I decided to schedule some time to play. From the first tee, you get the feeling of where you are from the brown road sign you won’t see in many other places. It says, “Grand Canyon National Park 101.” My wife thinks the policeman must get a kick out of watching golfers while he waits for speeders to come by. Below, I’m going for the green. You don’t get this background in many places, either. Those formations in the distance are at least 2,000 feet above the surrounding plain. It took about an hour to play. I had one birdie and a few pars. Not bad for still being in recovery from two quite strenuous hikes in the past three days. The best part is that the green fees, club rental, and cart all came to $20. Now that the hike I had been preparing myself for all summer is over, I can start devoting myself to golf again. Life is good. Golf is a recreational sport where the field of play is not standardized. Unlike softball or tennis, where if you’ve seen one field/court, you’ve seen them all, every golf course is different. That could be, in fact, the major attraction of golf — to try your luck on different layouts. Each one has its own challenges, tests, and design that encourages us to do our best and at the same time to enjoy the look of new surroundings. For developing your skill at the game, though, take some time to choose the courses you play on regularly. Playing on the right ones makes a big difference. Here are some things you might consider, given that you have enough different courses to choose from in the area where you live. If you’re a beginner, an executive course is the best bet. This is a short course, around 2,000 yards long or less for nine holes, and consisting mostly, if not exclusively, of par 3 holes. Most of the time you’ll be able to reach the green in one shot. Each time you swing the club the ball will be on a tee, making it easier for you at the start. Golfers who are comfortable with golf’s basic skills now want to find courses that present a well-rounded set of offerings. You might want to play one that is fairly wide open from the tee, so you can learn how to be comfortable just giving your driver a good whack. You might also want to play one that is fairly tight (rough, trees) to get you comfortable hitting your driver straight. On one course I play, if you get the ball in the fairway, the rest is easy. Miss the fairway and it will be a long day. Play a few courses with lots of hazards – water, bunkers – to learn how to avoid them, and more importantly to learn how not to fear them. I read some years ago about a touring pro who grew up on a course that had no water, and as a professional was always intimidated by water hazards. Play a course that forces you to hit accurate iron shots into the green. This would be one that has small greens, or larger greens surrounded by sand traps, thick rough, mounds, and so on. Play courses that develop your short game. One course I play on has thick rough around the green, so I had to learn how to hit very short shots out if it to nearby pins. Another one has closely-cut grass surrounding the greens, calling for a different kind of chip. 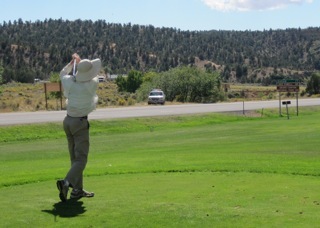 A third course, because of the hole yardages, has me hitting more pitches from 60-100 yards than any other. On some courses you can bump and run the ball onto the green. Others make you fly the ball on from close in. There is no one course that will develop a rounded short game. You have to travel to get one. Amenities are important, too. Is the staff courteous and helpful? Is the course easy to walk if you wish to? Is it well-maintained? Is it easy to get a tee-time? Quite important is whether the course fits your skill level. Each course has ratings, two numbers printed on the scorecard beside each set of tees. Most recreational golfers would best play on a course where the first number is under 70 and the second number is under 120, something like this: 69.3/117. Courses with higher ratings might be too hard and not as much fun. Remember, as recreational golfers, we play for the enjoyment of the game and the company of good friends in beautiful surroundings. Take advantage of the variety that is built into our sport, and you’ll have more fun, and may be even get to be a better player. Today I played a difficult course. I play it every year to see how I’m really doing. My home course is fairly forgiving, but this one isn’t. It’s carved out of the Pacific NW forest and if you’re off the fairway, don’t even bother looking for your ball. It puts a premium on hitting every shot as well as you can. Now I have all the shots I need to score well on this course. It’s just, like I say, there’s no room for clinkers. Take the first hole, Hugely wide fairway, doglegs right slightly uphill to a medium-sized green that is fronted by a creek. Any shot that hits short of the green will bounce back into it. So if you catch your first iron of the day a little fat, like I did, into the creek it goes. I found out today which shots I can’t get away with hitting like I do. When my club selection isn’t good. When my decision-making isn’t up to par. A tough course will expose all these faults, and that’s why you should play one very now and then to find out what you still need to improve on. When I got home, I wrote down my score by hole, then wrote down what I would have shot if I had played steady golf. Not especially spectacular golf, but if I had hit all the shots I can hit without straining the limits of my ability. I won’t tell you what the result of that analysis was, but I’ll tell you I would have turned in a very good score. I even took away a birdie. If you take away the shots you don’t expect to hit, irons that park themselves next to the pin get tossed out along with snap hooks. About a month ago, I wrote about being positive about your golf. This is my positive spin for today’s drubbing. I have the game right now to shoot a good score in this course. I know which errors to correct, and which shots I have to firm up by the next time I play up there. I can’t wait. When the U.S. Open was played at Oakmont in 2007, Tiger Woods said that a 10-handicapper wouldn’t break 100. He was being too kind. More like 120. Maybe. This course is so hard I don’t know where to begin. Natalie Gulbis said she played it five times before Women’s Open week and never came close to breaking par. I completely understand why. The fairways are not that wide, and if you don’t hit into the rough that looks innocent but grabs your club instead of letting it slide through, there are the bunkers. These things are big, and they are surrounded by a high mound on the side toward the hole. Chip out. Between these two, you can use up par just getting to the green. The course is quite hilly. A level lie is rare. There are blind shots into greens. There are shots downhill into greens that slope away from you. Fairway slopes feed the ball toward the bunkers. I saw one golfer hit 7-iron off the tee of a 558-yard hole to avoid the bunkers. Then there are the greens. The ones on which Sam Snead said he marked his ball and the coin slid off. Fast, slopy, have you ever seen someone go tink! on a 20-foot putt and have it go five feet by the hole? If I were allowed to play here, I would take a double bogey and not be disturbed, a bogey and be very happy, a par and faint. But let me tell you as well, this course is beautiful, and it manicured in every sense of the word. I have putted on greens shaggier than the fairway grass. And it’s big. You can see almost the whole thing from the clubhouse. It looks like no other golf course you’ve ever seen. Pictures do not do it justice. The men play there again in 2016. Make your travel plans.